In 2008 the Lehman Brothers bank collapsed, triggering an economic crisis that reached chronic proportions in certain European countries that were pejoratively called the PIGS: Portugal, Italy, Greece, and Spain. 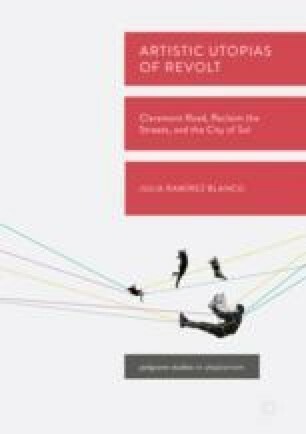 Ramírez Blanco’s analysis here is placed in the spring of 2011, when a protest camp was set up in Madrid, initiating a new cycle of Western occupations of the public space. This chapter deploys a first-person study of a camp in which utopia was put forward as politics, bringing with it its own aesthetics. The author studies the urban dimensions of the camp, as well as the poetics and aesthetics of its assembled banners. As the narrative of Artistic Utopias of Revolt closes, it traces an implicit line of continuity between the forms of resistance in Thatcher’s United Kingdom and opposition to the Europe of austerity politics that followed the economic crisis of 2008. The connection between the first chapter and the last is that, in both cases, the social movement is a place. Both the anti-roads movement and the dissident camps of 2011 are spatial typologies, replicated in distinct locations and extended in a viral manner. The utopian place functions as an embodied place in which one can experience another possible world.